If senior housing and care providers want to tackle the looming affordability crisis, they’re going to have to start working together more. That’s according to Jay Woolford, executive director of the Senior Housing Assistance Group (SHAG). The affordable senior housing nonprofit based in Tukwila, Washington, has made it its mission to help older adults age gracefully in settings they can afford. Some of the newest SHAG developments could provide a glimpse of the future, as they combine light staffing models with innovative partnerships to support various facets of resident wellbeing. But with the rising wave of older adults in perilous financial circumstances, creating affordable senior housing will take even more radical thinking — leading to “systemic changes” — in Woolford’s view. Senior Housing News caught up with Woolford to talk about affordability in senior housing, and what the industry as a whole will need to do in order to serve the millions of cash-strapped older adults set to hit retirement age in the coming decade. SHN: As we’ve noted before, SHAG has a really fun brand. You don’t seem to take yourselves too seriously. Woolford: At first I was getting a lot of grief about our name. When I first took on the job, it was like, really, that’s the name? Aren’t you going to change it? And it’s funny, we actually did a rebranding a couple years ago. We thought, maybe we should take a different name. But what we found was our brand recognition was just too strong. Nowadays, whenever I introduce myself or are talking to a group, I ask them, when you think of the word shag, are you thinking about a haircut, a carpet, a dance or Austin Powers? How many communities do you have now? We currently are operating 30 communities through the Puget Sound [area]. So, we’re from the Canadian border down to the Washington state capital, Olympia. And our communities are about 200 units, predominantly serving a market that is 50%-60% median income. There, that would be between $30,000 to $40,000 per year. We do have three communities right now that we operate as mixed-income. So, there’s 20% that’s set aside as tax credit, and the other essentially we’re serving an 80% median income market. And then we have two others that will be coming online later this year that fit that same bill. The last couple of communities we’ve done are fairly innovative in their approach. We recently opened up one in July of last year called Tukwila Village. And in that case, it’s ultimately a complex of four residential buildings that has a community center in the middle of it. The middle is a community outdoor space. We do farmers markets there, craft shows, things like that. And then the community building itself is actually run by a community nonprofit. The whole idea is to be able to get more intergenerational activity going on there. Because we’re literally at the crossroads between a public library and a high school, we’ve got a lot of kids traversing the property. And so, we’ll do programs at the community center that are similar to after-school lunch programs, they provide backpacks filled with food for kids. This is actually one of the most diverse ZIP codes in the country. The high school, they speak 52 different languages. It’s kind of interesting, given that the Northwest is like 60% white. But we happen to be an extremely diverse community. As part of our next phase, we’re going to be doing sort of a food incubator where we’re working with another nonprofit called Food Innovation Network to put in essentially a small food court that would be operated by folks going through a training program. Predominantly immigrants that are working to understand the food service industry in the U.S. and bring in their own cuisine. They’ve already gone through a study program at another place to get the basics. They’ve come into this new facility to be able to run a business, then once they’ve got a business plan, they move on to their own venue. So, we’ll be able to offer some food variety in the community through that type of program. As part of community center, there’s a nonprofit that owns a coffee shop and they also do workforce development. So, those are some of the innovative things we’re trying to do in this community. We’re about to open one later this year over on the East Side, in Bellevue, Washington. That one is a mixed-income property, and it is actually being developed in a regional mall. The location is literally between new apartments and then the mall itself, we’re right next to a movie theater. We’re adjacent to grocery stores, craft stores, urgent care, there’s a big food court, kind of a similar idea to the one I explained before. It was a local developer which created this thing called ThIrd Place Books. It’s really about bringing people together in community space, there’s book selling, and food is part of that. This also backs up to a municipal golf course. And it’s on three different bus lanes. So, it’s really looking at that model that takes advantage of some of the opportunities that these malls present, where they’ve created their own kind of town center aspect. It becomes very much a walkable community for residents and to have access to all those type of amenities right there. We think is going to be pretty compelling. And what was the other community? The other is in Bothell, Washington. That’s also a mixed income community that’s going to be in what I would call an emerging town center in Bothell. The city is on the north end of Lake Washington, and they’ve been redeveloping the area with a new city hall, new community amenities, shopping. Our property is going to be in the middle of all that, also. How does SHAG describe its affordable model? It seems like that word is a catch-all for a few different kinds of senior housing. We call it independent living light. We build in a lot of the amenity spaces that you’d find in market-rate apartments. We’ll have community rooms with a place for people to cook, we’ll have media centers, we have computer cafes or labs, craft rooms, exercise rooms with equipment, yoga spaces, mat exercise areas. We also provide a community van and an electric car. We’re trying to broaden the transportation options that people have. But we’re lightly staffed. We don’t have an activities director, for example. We don’t have a full-time dining program. We’re looking at some programs to bring in home care type services for people. The model is trying to get residents to generate the activities that go on in the communities. And we support them through a couple different areas. We’ve developed a team that is our programs and partnership team. Their specific focus is around developing toolkits for communities, so that they’re able to have a different variety of resources available to them. They will also help with coordination in partnerships, for example with universities, colleges, area agencies, things like that, to be able to bring support services in. We also then have a resident service coordination program. So, every community has a service coordinator that spends a certain amount of time in the community working either with individuals or the community in general. Also in coordinating with other agencies like our Department of Human Services or other organizations that will come in and help support the community. We know senior housing has an affordability problem, and nobody seems to have the answer on how to overcome it. At the same time, the baby boomers are about to age into senior housing settings en masse. Do you see this problem getting worse before it gets better? We’re serving a niche right now that is underserved. I would tell you candidly that we also are serving a market that is kind of living in many ways on the edge. Affordability is relative. We’ve tried to stay away from the word affordable because it gets misunderstood. So, part of our recognition of what our mission is, we kept the name SHAG but we changed the meaning to Sustainable Housing for Ageless Generations. Our mission is around sustaining housing and sustaining lives. On the first side, it’s what are we doing to be able to support people to not only to create affordable housing that meets their needs, but what are we doing to make sure people can maintain their housing? Because, in an area like where we live, where the cost of housing continues to rise, incomes continue to go up, and you’ve got folks on fixed incomes that are for the most part stagnant, if you live in a community for 5-10 years, you’re going to fall behind. And a good example in the Seattle market area: the rule of thumb is you want to spend 30% of income on housing. The reality is, seniors are spending more like 47%, and going up. So, folks that are moving into affordable housing are rent burdened, even in affordable, from the day they move in. So, it’s a complex issue. It’s not as simple as saying we can produce housing and we can charge rents of $1,000, which we need 50% of what the market rent would be, and still think you’ve been able to fulfill that mandate. Because the affordability issue just continues to spread. I think the other area that we look at is, how do you manage that gap? If you know the cost of goods and services and housing is going to continue to go up as an individual’s income continues to remain flat, over a period of time, what can you do to be able to make sure you’re getting resources to those individuals to be able to help manage what they’re able to purchase? The sad fact is, folks that are eligible to get into public housing where they’re only required to pay 30% of their income, oftentimes they’re better off than folks who are above that threshold level and are having to spend more of their income on rent. And that just shrinks what’s left of their disposable income. We look at things like food security. Our residents, with our support, are helping to organize food pantries. We also co-locate with food banks. Residents will volunteer, and some residents will utilize them. Also, trying to provide transportation, whether it’s through people signing up to use the electric car or use a community van, try to get people to not rely on their own vehicles. That’s a really hard thing for people to change. We are doing more and more with nursing schools, pharmacies, in order to bring wellness programs into our community to make sure our residents are getting the type of wellness and exercise to keep them healthy. We’re really looking at the indicators of wellbeing. In many ways, that’s going to be the biggest struggle. I know we had talked about the cost of building affordable housing, but I know in our market, that’s a big thing, affordability is huge. We have to compete with everybody else that’s looking to do affordable, whether it’s for homelessness or workforce housing. So, there’s a lot of competition around that in itself. But senior housing has its unique challenges. We’re the first generation that didn’t really have pensions, instead relying on 401(k)s that, at a time when you’re trying to manage for older parents and kids that are coming up, savings are not what I think people thought it was going to be. And with longevity, it’s a perfect storm. I think we are doing our part. But one is, it’s one thing to produce the housing, it’s another to really maintain it for people. And then the other is just trying to keep up with demand. My personal observation is, most people want to stay in their own home. The fact of the matter is, our housing stock has never been designed for people to age. Universal design was not part of the thinking when you had split-level or Victorian homes. So, the need for suitable housing is great. And then I also think the idea of being able to aging in community versus aging in place, those challenges are going to be greater in suburbia, where things are much more diffused. We find in our urban and ex-urban environments, the residents are really well-suited for aging in place. 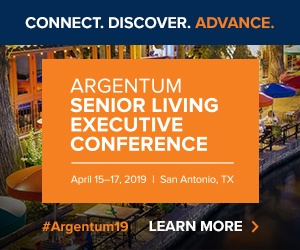 Do you see a future where the more affluent people live in traditional senior living, and the rest of us either live at home or in one of these fixed-income affordable communities? That’s probably correct. I believe there will always be a market for those that can afford to have that seamless integration of services. From an affordability standpoint, there’s got to be a mindset change from the consumer standpoint, too. I think we still stick our heads in the sand when we think about aging. Quite honestly I’m no different. I talk about our housing as being need-driven housing, but it’s not need-driven where it’s like assisted living where it’s a health care need. It is need-driven by two factors. One is economics, and the other is security. We get a lot of folks who have already transitioned at some point, they’ve gone from a single-family house to multifamily condo, or maybe they were living in a multifamily apartment building and they decided at a certain point all the activity going around them in multifamily is more than they want and they want to find a more secure environment. So they’ll seek out a community like ours. There’s an aspect of need that drives people to it versus a lifestyle change, as much as everybody would like to think it’s a lifestyle change. Do you see a new model emerging to help deal with the looming affordability crisis? Perhaps one that bridges the gap between affordable housing and traditional senior living? My personal feeling is that there needs to be a systemic change around this. A lot of it is around the idea of community-based support services. In an ideal world, it would be having the housing interconnected with community clinics, with nutrition services, with wellness services, and then ultimately tied with higher levels of care. It’s almost like a virtual CCRC, where we’re able to maintain relationships with all those different entities to be able to provide either services in the community, or our residents will be able to go outside to do that. At the end of the day, how does that network get paid for? I think we see models that could work, like SASH, which is in Vermont. What it’s really doing is, it’s creating health homes where there’s a service coordinator and a wellness nurse that uses affordable housing as its home base platform. They can also provide that kind of coordination into the neighborhood so people can opt in to be part of this. On the payer side, it’s a combination of Medicaid and Medicare, so you’re getting all these payers paying into the pool to serve the population. I think that’s an area that we have to be looking at. We know it’s a lot less expensive to keep people healthy in housing than having to have them move to higher acuity levels. It’s a matter of, what are we willing to invest as a society to be able to do that? What is CMS willing to do? And then what are the insurance companies, Medicare and Medicare Advantage willing to look at to recognize that keeping people healthy in housing is going to be a lot less expensive than hospitalization or having to move people into assisted living, memory care and nursing homes? So, it really is back to that idea of creating a network and a payer mechanism to be able to do that. We tend to be larger than most affordable providers. Our communities range up to 450 units, so we’ve got critical mass in our buildings. From a service delivery standpoint, there’s a kind of scale for them. We’re looking at opportunities to co-locate with health care clinics, we’re looking at opportunities to be practicum sites for nursing schools. We’re working on a medication management program with the School of Pharmacy at the University of Washington. So, the grand idea is, how do we connect with other organizations in order to be able to be able to provide those services? Our model is network nonprofit. My interest is not building all these new business lines. My interest is being able to connect with the entities that have either found their funding sources or need our critical be able to support them. And then that becomes kind of a win-win for everybody. Are you familiar with the “Apartments for Life” concept from Frank Rockwood and his firm, Rockwood Pacific? This idea sounds similar to that one, where the goal is getting older adults into one large affordable setting in order to support their needs as they age. Oh, yeah. Frank and I worked together at Sunrise years ago. And that’s exactly right. It is that idea. It takes a village to participate in that. So, that’s what we’ve been doing, trying to break down those barriers so that we’re not seen as just an island of senior housing, but what can we provide outside our walls and what can come in from outside into our walls? It’s about becoming more of an integral hub in our communities. What can the traditional for-profit senior living industry learn from affordable senior housing organizations like SHAG? I do believe there are a lot of what I would consider to be mission-driven for-profit providers. I think one of the things that is strong in the nonprofit world is the open-source architecture, the willingness to really share information among each other as a collective body, all trying to find a way to solve this bigger issue. We all need to be able to make sure we’re running our businesses to be sustainable. It really is looking across the broader spectrum of providers, with the idea of all of us thinking about the continuum of support and services. That’s what we need to be really looking at.